If you feel like you're paying too much on your student loans and want to save some money, student loan refinancing and consolidation may be right for you! For Pay My Student Loans Scholarship Opportunity Click Here! College is getting more expensive every year. While going to college is surely something to be proud of, and is a great investment in your future, most students and their families are unable to pay for it out-of-pocket. After all scholarships and grants have been exhausted, the next option is student loans. Nowadays, 7 out of 10 college graduates have student debt and the average has over $35,000! If you took out a loan to pay for college, you are probably paying too much, and could potentially save thousands through refinancing! Refinancing your student debt is just like your car or home mortgage. The new lender pays off your old one and gives you a new one with new, hopefully lower interest rate. By lowering your interest rate, less additional money will be added to your total balance each month, ultimately saving you money! Most lenders also allow you to refinance and consolidate multiple loans into one, making repayment much more manageable. In the following sections, we will go over the refinancing and consolidation lenders in the industry and what they offer. Members save $22,359 on average! Lower interest rates and payments are available. Customers have saved $1,584 per year! Reduce the the total cost of your existing student loans! Refinance with a credit union. Average client saves over $15,270. This post is the result of extensive research into the best options and compares the 9 most common online consolidation and refinancing choices. These companies are all reputable private or federal companies that accept online applications. If I have missed any companies please let me know and I will add them to this comparison post. If any of the information gets out of date or is incorrect let me know and I will update it! Should you apply to more than 1 company to consolidate and refinance your student debt? Yes, according to FICO, all applications made in the previous 30 days does not impact your credit score and having a group of applications on your credit history gets grouped to minimize impact. There is no harm in applying to all. SoFi is one of the largest student loan refinancing companies and has quickly risen to the top over the past few years. The company boasts its desire to help its customers by offering zero fees, better interest rates, and unmatched customer service. The company has a mission to help others achieve all of their financial goals. If you choose to consolidate or refinance your loans with SoFi, you will also receive additional benefits such as unemployment protection, career counseling, and support every day of the week when you need it. SoFi does offer student loan refinance programs and the lender has funded over $10 billion in loans to date, has helped its members save over $760 million, and has a total number of 143,500 members. SoFi boasts flexible and low rates and repayment terms for your student loan consolidation and refinancing. In fact, they offer a variety of plans to help meet your needs. There are no simple one size fits all here. One of the benefits of the program is that you will NOT incur any prepayment penalty fees and there are absolutely no origination fees. There are two options for rates, which include a fixed interest rate that ranges from 3.375% APR to 6.740% APR. The variable interest rate option ranges from 2.565% APR to 6.490% APR. The repayment term length will vary depending on your needs; however, SoFi offers 5-year to 20-year plans for both the fixed and variable interest rate. SoFi is a great all around option with some very low interest rates which also includes some beneficial social programs. SoFi is a lender who refinances and consolidates both federal and private student loans. Extras like career services and the entrepreneur program are great extras for people who can take advantage of these programs. There are many different benefits to choosing and working with SoFi to refinance your loans. In fact, you will find that you can easily and quickly apply over the Internet with an approval in as little as 15 minutes. SoFi allows you to consolidate both your private and federal student loans and the company helps members save roughly $18,000 or so over the course of their loan. In addition, SoFi also offers unemployment protection, which will come in handy when you lose your job. If your job is lost, SoFi will suspend your payments temporarily to help you get back on your feet and start earning an income once again. Lastly, SoFi has a customer service team that is dedicated to helping you from the moment you voice an interest in the company. No matter what type of support you need, their customer service team will walk you through the process. After I was laid off, I got a call from SoFi asking how they could help me find a job. I was completely blown away. One of the biggest downsides to student loan refinancing is that you may not qualify for it. SoFi does look at your credit, but they stress emphasis on your career experience, financial history, education, and monthly income vs. your expenses as factors. Another downside is that it is possible for your rates to be higher than the estimated amount. In fact, rates for a 5, 7, and 10-year term with a variable rate is capped at 8.95% APR while a fixed rate is capped at 9.95% APR. SoFi is a great all around option which is evident by their rise to become one of the most popular lenders. Citizens Bank, also known as Citizens Financial Group, Inc., is a largest bank that offers student loan consolidation and refinancing options to students. In 2015, the bank was named the 13th largest in the US. In fact, the company has a total of 3,200 ATMs throughout 11 different states and about 1,200 branch locations. Citizens Bank is dedicated to offering a wide variety of services to its customers including convenience when it comes to banking. In fact, some branch locations have been setup in supermarkets and even one in a Dunkin’ Donuts. When it comes to student loan consolidation, you are likely to find an option that meets your needs. Citizens Bank offers multiple rates and repayment terms to ensure that there is an option that meets your needs. The company offers both fixed and variable interest rates. The variable interest rate ranges from 2.59% to 8.38% APR. The fixed interest rate ranges from 4.74% to 8.24% APR. When consolidating and refinancing your student loan, you have the option of a 5, 10, 15, or 20-year repayment term. Citizens Bank states that they save their customers, on average, $140 per month when they refinance their loans. It is important to consider all of your options when you start to discuss the possibility of student loan consolidation and refinancing. One of the few companies that do not require graduation. The long term fixed interest rate is very competitive! There are quite a few benefits that Citizens Bank offers when it comes to student loan consolidation. The first reason that students choose Citizens Bank is because you can lower your monthly payments and also receive a low and competitive interest rate on the loan. There is a max term of 20 years, which means that you can choose a 5-year pay off term and have your student loans paid down in no time. If you choose to go with a fixed interest rate, this rate will be locked in for the entire life of your loan and you never have to worry about rate increases. Lastly, you will find that it is much easier to manage and keep track of your student loans once they are all consolidated into one. As with anything, there are some downsides to choosing Citizens Bank to refinance and consolidate your student loans. The first downside is that the application process takes longer than some of the other options available. Next, you cannot be currently enrolled in school to refinance. This means that you must either have dropped out and do not plan to go back or you have graduated. Lastly, it is likely that you will need a cosigner for your application and if you do have a cosigner, that cosigner will need to remain on the loan for at least three years, which is a long time. Citizens Bank is best for any former student who did not complete college but has a history of making their payments in full. LendKey is an online platform and marketplace that allows students to apply for new private student loans and student loan refinancing. The company is dedicated to being able to meet the needs of all students while providing them with affordable student loan payments. LendKey was first founded in 2007 and was known as Fynanz Inc., but took the new name LendKey in 2013. As of the year 2014, LendKey had a portfolio of roughly $700 million and over 30,000 borrowers. If you are thinking about consolidating or refinancing your student loans, you may want to consider working with LendKey, as they do offer repayment plans to help you afford your student loan payments. LendKey allows students to consolidate and refinance their student loans to make payments more affordable. The company claims that students will save an average of $10,500 annually on their loans. The term period ranges in size to meet your needs from 5 years to 20 years. LendKey offers two different types of interest rates which include a variable or fixed rate. The starting APR for a variable rate is 2.09% and the starting APR for a fixed rate is 3.25%. LendKey offers a competitive interest rate with some additional benefits including the interest-only option. By aggregating 100’s of Credit Unions the risk profile of the credit unions will be different and you ability to get awarded a loan goes up. There are quite a few benefits to choosing LendKey to consolidate your loan. For starters, the company does offer low interest rates to students, which can help lower your monthly payment amount. You can also extend your student loan over the course of 5, 10, 15, or 20 years. LendKey runs promotions all of the time for new customers who choose to refinance with them and you may even receive some cash back or a statement credit to use toward your loan. There are no hidden fees that you have to worry about, which means no origination fee and no early penalty fee for paying your loan off before you reach the term. Lastly, LendKey does offer flexible payment plans and options to ensure that you are always able to afford your student loan payment. You will need to become a member of the credit union that offers consolidation and refinancing. This can add some complexity and time to the process. As with any other lender, there are some downsides to choosing LendKey to consolidate and refinance your loans. One of the first downsides is that you must be a member of the union to be eligible to apply for the loan, which means you will need to join and this can slow down the processing time of your application. Lastly, you will find that LendKey allows you to consolidate both your federal student loans and private student loans together, but this means that you will lose your federal loan benefits, which may not be the right choice for some students. LendKey is best for someone who wants a more personal experience due to the credit union aspect of the business. Earnest is a unique lending institution that is committed to being able to provide consumers with the credit they deserve. In fact, the company places an emphasis on consumers who are financially responsible. The company seeks to help eliminate high fees that are often paid when you head to the large name banking institutions. Low rates are no surprise here and you will find that the company has many different rates and term options to lower your student loan payments. Earnest offers a variety of rates and repayment terms for you to choose from and qualify for. The company does offer both fixed and variable interest rates. The starting APR for a variable rate is 2.34% and the starting APR for a fixed rate is 3.25%. Earnest offers loan payment terms of 5, 10, 15, and 20 years. Earnest offers competitive interest rates with some additional benefits including the interest-only option. Earnest's unique criteria uses hundreds of data points, not just a credit score like many other lenders. Working with Earnest does have some benefits that come along with it. In fact, one of the biggest benefits is that Earnest has made a commitment to never sell off your loan to a third party servicer. Earnest promises to be your lender throughout the entire life of your loan. If you do receive approval to refinance your loan with Earnest, you can actually choose your monthly payment amount and also choose whether you want to receive a fixed or variable loan. Many other lenders will simply tell you your monthly payment, but not at Earnest. The application is quick, simple, and convenient. You can submit your information to receive a rate quote without a credit check actually being run. This rate check will provide you with an estimated interest rate for your loan if you are approved for refinancing and consolidation. Lastly, when you do apply for refinancing, Earnest does NOT only focus on your credit score and they have an algorithm that takes many other factors into consideration, which means you will likely be approved here over larger lenders. Just like any other institution out there that consolidates and refinances student loans, you will find that there are some downsides to choosing Earnest. The first downside is that you cannot refinance unless you have a completed degree in hand. This means that if you are still in school, you will not qualify. Another downside is that you must have attended an accredited school and you must reside in a specific state. In fact, only about 38 states appear on the list. Lastly, you may be hard-pressed to find a ton of reviews or information about the lender because they are somewhat new to the industry and do not have a solid track record as do some of the other options. Earnest is best for someone who is willing to handle a slightly more complex application process in return for a greater chance of approval. Earnest is a great lender to work with if you want flexible payment options and a lender who cares more about you than your credit score. Below, we will go over some of the main benefits of working with Earnest. CommonBond is a financial lender that has entered into the marketplace and offers students a great way to reduce their student loan interest rates and monthly payments. The company offers both consolidation and refinancing options to students who qualify. The company was first founded in 2012 and has quickly expanded to be able to service many students across the US. CommonBond is committed to being able to help students lock in low rates on their student loans. With a variety of rates and terms, you will find that CommonBond is a great option for all of your student loan refinancing needs. Their focus is on making the future earnings potential of advanced degree holders reflected in their refinancing. For every loan funded on their platform they fund the education of one student in need for one year. This is funded through the Pencils of Promise charity. CommonBond has a commitment to its consumers and that is to be able to offer the lowest rates and payments for student loans. Students can refinance their student loans and receive a variable, fixed, or hybrid rate. Variable rates with CommonBond start at 2.32% APR and range up to 6.18% APR. Fixed rates start at 3.37% APR and range up to 7.74% APR. Hybrid rates start at 3.85% APR and range up to 6.29% APR. CommonBond offers a variety of repayment terms with the shortest being a 5-year plan and the longest a 20-term plan. You can also choose from a 7, 10, or 15-year plan as well. CommonBond offers some of the most competitive rates on the market. If you are looking to work with a company that has a strong social commitment CommonBond is a great choice. There are a number of reasons why you should work with CommonBond when it comes to refinancing your student loans. The first benefit is that there are no hidden fees. This means that you do not have to pay a penalty if you choose to pay your loan off early. Also, there are no application fees to apply and you do not owe any origination fees either. Another benefit is that you can apply for a forbearance program that CommonBond offers, if you find yourself in a sticky situation. The program varies a bit from the federal program, but it is similar. Your student loan payments will be temporarily stalled while the forbearance is active. CommonBond does offer some of the most competitive rates available for student loans, so they are a good option for many students. CommonBond used to be very selective. The company used to only offer to 100 programs but continuously opening up to new people now offering loans for over 2000+ programs. As with anything, there are some downsides to consolidating your student loans with CommonBond. One of the first downsides is that you must have graduated, which means you cannot be attending school at the time of the application and you cannot have simply dropped out of school. Also, you must have graduated from an accredited college or university. The only other downside is that the approval process is pretty restrictive and new loans and programs are being offered all of the time. The company first started out offering just 100 different programs and now offers over 2,000. Consolidating your debt with CommonBond is best for a graduate from one of their selective graduate school programs listed. Their competitive rates and social commitment make them a great choice (if you can qualify!). CommonBond is a good choice for students who want to consolidate and refinance their loans and receive a lower interest rate. Below, we will go over some of the most attractive offers from CommonBond. Laurel Road is a division of DRB; an FDIC insured bank, that offers student loan refinancing to borrowers in all 50 states. The company does provide student loan refinancing to those who qualify for it. Laurel Road is committed to providing all of its customers with a hometown feel, but all of the benefits of a big bank and lender. The company states that a professional is always close by when you need them and that you can expect loan turnaround times to be fast. Whether you want to consolidate your loan for a more affordable rate or you are simply tired of a high interest rate from your current lender, Laurel Road is here to help. One thing to keep in mind is that Laurel Road is considered the second largest lender within the student loan refinancing industry and there are student loan consolidation and refinancing options available for parents, undergraduate students, and graduate students. We look at a borrower’s credit and accomplishments. Laurel Road recognizes that by completing your college or graduate degree and landing a professional job, you’ve earned lower student loan rates. We believe that working professionals with degrees have proven their ability to pay back student loans. Laurel Road offers a variety of rate and repayment options to help you better afford your student loan payments. You do have the option of both a fixed or variable rate. Laurel Road offers term options from 5 years up to a max of 20 years, with a 7, 10, and 15-year option available, if you choose. It is important to note that the interest rate you receive will depend on the term you select and also on your credit and other factors. Competitive interest rates and available for parents as well. Refinancing your student loan through Laurel Road is a great way to get a lower interest rate and lower monthly payment on your student loans. There are quite a few benefits to working with this lender. The first benefit is that borrowers can also get a 0.25% rate reduction if they sign up for automatic payments on both variable and fixed rates. Next, there are no early payoff penalty fees and there are no origination fees that will be incurred by the loan holder. Lastly, Laurel Road does offer a forbearance program that recognizes hardships that some students may experience. The forbearance option will stall payments for a number of months based on the students’ need. Note: Forbearance is at the discretion of Laurel Road. Very selective based on the program you have graduated from and has one of the highest income qualifying expectations. One of the biggest downsides to working with Laurel Road is that you must be a college graduate with a Bachelor’s degree or higher to qualify to consolidate your student loan. This means that if you do not meet these requirements, you will not receive approval from the lender. Laurel Road does allow you to consolidate both your federal and private student loans, but it is important to know that you do lose all benefits of your federal student loan when you refinance it. This means that it may not be a good idea for all students. Laurel Road is best for Parents or Graduates who have graduated and started working from one of the qualifying programs. Laurel Road and CommonBond should both be applied to if you have an advanced degree from a qualifying school. Here, we will recap why working with Laurel Road is a great option when it comes to consolidating your student loans. If you are already a Wells Fargo customer Wells Fargo is a good option with both an existing customer and automatic payment discount of 0.25% each. With a competitive interest rate of 3.75% (absolute lowest) they can be a good private and federal refinancing option. If you are a customer of WF then with the discounts the variable interest rate can be competitive. In addition the qualifying standards are lower than many of the other options. Slow application process 45-60 days and a high interest rate, especially if you are not an existing customer. WF is a good option if you are already a Wells Fargo customer and have lower gross income. WSFS Bank is a medium sized bank located out of Delaware. Their interest rates, borrower forgiveness and extras do not make them competitive when compared to the other offerings. The only benefit I see going with WSFS Bank compared to other options is the fact that they have one of the lowest minimum limits of $5,000. The application process for WSFS is actually through the CU Student Loans platform. There are few strengths to WSFS compared to other options that I can find. The biggest difference is that they have a $5,000 minimum which is lower than most others. Interest rates are higher and there are no additional benefits compared to other options. Students with between $5,000 and $10,000 in debt. If you are struggling to refinance and consolidate your educational debt than true peer-peer lending sites are an alternative option. There are many downsides to this option however, if you are unable to work with other sources this is the lender of last choice. Do not refinance federal student loans here as both the interest rate and repayment terms will be harsher. Higher interest rates and shorter term compared to the other options. Recent grads with good credit, no cosigner and no current employment/income history should consider Prosper to see if the loan would have a lower interest rate than their current student loans. If you hold federal student debt with the government you have 3 options. A Direct Consolidation loan is a way to combine multiple federal student loans into one. When you consolidate federal student loans you will reduce your monthly payments by extending the length of repayment and potentially reducing the interest rate. Furthermore, the interest rate on the new one will be a weighted average of the old loans. The benefit of a Direct Consolidation loan is that you can significantly reduce your monthly payments however you should also determine what the added interest cost over the life will be. If you hold debt from the Federal Government and want to consolidate it you may be able to find companies that offer better interest rate than you can find from the Government. The downside to consolidating a federal loan into a private one is that you lose the benefits and protections that come with federal student loans. These include forgiveness, eligibility for certain repayment plans, and deferment & forbearance protections. Make sure the benefits of refinancing federal debt into private debt. This is a relatively new option but with the growth of peer to peer lending sites there is the opportunity for students who don't qualify for traditional loans to get one through one of these sites. Lending Club and Prosper.com are the 2 most common ones. When you get a private student loan it falls under some of the same rules as a federal student debt, specifically if you declare bankruptcy your debt will not go away. When you consolidate private debt you achieve the most significant benefit of being able to combine multiple monthly payments into one payment to one company. Consolidation is technically the combining of multiple federal education loans into one which takes the weighted average of the interest rate and lowers the monthly payment by extending it over a longer term. Refinance is paying off your current debt and accepting a new one at a lower interest rate/longer term to create one that better suits our needs. In this article I have used refinance/consolidate interchangeably. Can I combine both private and federal student loans? Yes, many of the lenders above offer opportunities to combine both federal and private student loans. When consolidating federal student debt be sure to think about your ability to repay it. Private loans have much stricter collection programs when compared to a federal student loan. Can I consolidate my loans if I didn’t finish college and never graduated? Yes, but your options are limited. Currently there are three options you can apply for with your best being CharterOne. If you don’t get accepted at Charter One than Prosper and Personal are options to consider. Should I apply to all companies and how will applying to multiple companies affect my credit score? There are 2 downsides to applying to all companies. Your time – Applying to all can take a lot of time but if you really want to find the best option for you. Your Credit Score – The more people who have looked at your credit score the more your credit score will go down…is the common “myth” in fact if you have many similar searches within the same time period it is clear you are shopping for a single product and this group of searches essentially gets treated as one search. Therefore, it does not impact your credit score applying to multiple loans. FICO ignores all student loan searches made in the previous 30 days according to their website here. Does Sallie Mae offer refinancing or consolidation? However, if you have Sallie Mae debt, you can refinance or combine these loans with others. Are there Chase student loan options? If you have a Chase Student loan your options are the lenders listed above. Are there CitiBank student loan options? Does CitiBank offer a private educational debt refinancing and consolidation option and if so what are the rates? Again, Citi does not have any options available according to their website. Any of the lenders in the table can consolidate a CitiBank student loan if you have a Citi Student Loan. How to calculate debt to income ratio (DTI ratio)? Add up all your recurring debt obligations (mortgage payments, car payments, student debt payments and minimum payment on credit card balance) then divide by your gross monthly income. Which is better a fixed or variable rate loan? A variable interest rate will be lower initially but depending on where the prime interest rate goes the rate will climb. There are a lot of posts that analyze this question in depth including a great post at SoFI Fixed vs Variable. The bottom line to me is if you are risk adverse then stay with a fixed loan while if you are more risk tolerant than a variable will on average cost you less in the long run. “Before you refinance your student loans or switch types, be sure to ask the right questions! For example, does the variable interest rate have a cap? A cap places a maximum limit on how high a variable interest rate can go. This type of mechanism can be a great protection against rising interest rate risk. Can a parent who took out a student loan for their child refinance? Yes a parent can refinance educational debt that was taken out for their child. Often with the income and employment history parents can get some of the most competitive interest rates. Can an international student refinance? If you are an international student you are probably sick of seeing “US Citizen or Permanent Resident” but unfortunately that is the case. You must be at least a permanent resident or get a co-signer who is a US citizen or permanent resident. If you are looking for more information on International Student Loans you can visit the experts at InternationaStudentLoan.com. When is the right time to refinance/consolidate? The right time to refinance is whenever you can save money at an acceptable risk level. What I mean by that is if you can refinance your loans now and it will save you money without increasing your risk then it makes sense to do so. It may not make sense if you have federal student loans only and can save $100/year…you are increasing your personal risk due to more aggressive collections for minimal benefit. However, the majority of students who qualify for consolidation would be better off financially consolidating as soon as they are eligible. Many students turn to refinancing to help them better afford their loans, but others who may find the program helpful do not know how it works. Below, we will discuss how exactly it works to give you a thorough understanding. Simply put, it is a way for you to restructure and re-work your student debt to receive a new interest rate, which lessens the amount you will pay over a set number of years. Students choose to refinance their student loans for a number of different reasons from wanting a lower monthly payment to shortening or extending the length of the loan. Unfortunately, student loans are not just automatically refinanced and you will not just receive a new lower interest rate because it is there. You must apply and go through the entire process. The first step will be to apply through your lender. You can choose any lender that you want, but always make sure to research the company, read reviews, and look over the contract BEFORE you sign anything. You will need to have a good credit score along with a low debt to income ratio to qualify. If you do not have this, you will be required to have a cosigner. If your application is accepted, then your lender will pay off your current debt and then create a new loan for you with your new interest rate and agreed upon terms. You will make payments to the new lender from now on. You will no longer have to worry about paying your old lender and your student loan will show paid off on their end. Can Refinancing Really Save Me Money? Yes. Refinancing can actually save you a lot of money in the long run. When it comes to your monthly payments, depending on the length of the loan, you may end up paying more or less per month. If you choose to extend your repayment term you may end up spending more over the life of the loan; however, if you shorten or keep the term length the same, you will save money. For example, if you have a current balance of $15,000 with a 7 percent interest rate and 10 years left to pay, you will end up owing $174.16 per month, but the total amount in interest you will pay over those 10 years is $5,899.53 and this will be added to the $15,000 loan balance for a total amount of 20,899.53. If you were to refinance and keep the same $15,000 balance over 10 years, but with a 4 percent interest rate, you will find that you owe $151.87 per month and the entire interest paid will be $3,224.12 for a total amount of $18,224.12. If you are new to the idea, we will go over some important requirements needed to be approved. Not everyone will be approved and if you know the requirements beforehand, you can decide if this is the right avenue for you to travel down. Your credit score comes into play when you want to refinance and if you do not have a good credit score, you will not be approved for refinancing. In fact, most lenders require you to have a minimum credit score of 690 – 700, but some may even require it to be higher. Now, if you have a credit core of 750 or higher, then you will likely be approved, but not all graduating students have this type of a credit score. If you have a poor credit score and poor history, then you may want to consider another option as you will not qualify for refinancing. In addition to a good credit score, your debt-to-income ratio should be low. If you are unfamiliar with what debt-to-income means, it is basically how much debt you have in relation to how much money you make. For example, if you make $40,000, but you have a total debt of $90,000, then you do not have a good debt-to-income ratio since your debt outweighs your income. Most lenders prefer you to have a debt-to-income-ratio of less than 40%. You will need to be able to show that you can afford the debt you have to make payments on that don't include student loans in addition to the new terms when you refinanced student loans. If you are unemployed, then you are not going to qualify. This also plays into your debt-to-income ratio as well because if you have no job, then you have no income coming in and your debt will obviously outweigh your income. Most lenders will require you to show that you have held your job for a certain amount of time and also show pay stubs to show how much you make on a regular basis. Your lender wants to know that you have a good employment history and you are not just working to get the refinancing and then you plan to quit. Many lenders will require that you have a minimum balance as well. This amount will vary depending on the lender, but you can expect the minimum to be about $10,000. Some other things to consider include whether or not you will qualify for a forgiveness program. If you plan to apply for one, then refinancing may not be the best option for you. Typically, when you refinance, you void the number of qualifying payments you have already made and you will have to start over. Lastly, if you do not qualify on your own, you can have a cosigner sign the refinancing application with you. The cosigner will need to meet all of the eligibility requirements though, so make sure you choose someone with good credit. If you are interested in refinancing and you want to know if you are eligible, contact your chosen lender or speak with your servicer. If you owe a lot of money in educational debt, it may be wise for you to refinance your loans. The amount of money you save in the long run is significant and you will be shocked when you see the numbers. Below, we will go into some specific examples to help break it down for you. For the first scenario, let’s say that your current balance is $45,000 and your interest rate is set at 8.5 percent. Your original term is set at 20 years and you still have 20 years left to go on your loan. You go into a financial center to talk about your options and you are looking to refinance at $45,000 with a new interest rate of 4.99 percent over the same 20-year period. Your original loan would require you to make a $390.52 payment each month with the total interest paid over 20 years total $48,724.91, which would mean your total cost is over $93,000 in the end. With the new terms, your payment each month would be $296.73 and your total interest paid would be $26,215.57, which would make the total loan cost $71,000 over the 20-year period. As you can see, not only will you save money monthly, but you will save $22,000 over the course of the entire loan. For this scenario, we will run the numbers a bit different to give you an idea of how refinancing works. Let’s start with a balance of $25,000 at an interest rate of 7.9 percent. You are on a 20-year payment plan and have paid 10 years toward to loan, so you have 10 years remaining. When you go to refinance, you are looking at the same balance of $25,000, but at a 4.99 percent interest rate for a 10-year period with all 10 years remaining. With your original loan, you are required to make a $207.56 monthly payment and the total amount of interest paid at the end of the term is $24,813.64 for the 10-year remaining period. With the new terms, your monthly payment is a bit higher at $265.04, but your total interest paid to the end of the term is $6,804.99. Even though you will be paying more per month, you will save a significant amount of money overall. The lower interest rate will save you thousands of dollars over the course of your loan and sometimes, this amount is a HUGE difference. When you run scenarios with an even lower interest rate under the new terms, you save even more money. For example, take the same terms as scenario two, but make the new terms an interest rate of 3 percent, the total interest paid is $3,968.22. There are tons of options out there to help those looking to save money through refinancing. With so many lenders to choose from, however, it can often be difficult to decide who to go with. Luckily for you, there are a few useful resources that can help you make sure you are making the right decision. We will go over them below. LendEDU allows its users to compare offers from up to 13 different lenders with just one application. What's even better is that the application only takes 5 minutes to complete and is free! The company utilizes a soft credit pull so your credit score won't be negatively impacted. This is very important as eligibility is for refinancing is often based on credit worthiness. Bankrate has a very useful student loan calculator that allows people to input how much they have left on their student debt, their terms, and interest rates. The calculator then tells you what your monthly payment will be and how many extra payments you have to make to pay off your loans. ​Heather Jarvis, a self-proclaimed student loan expert, has tons of tools and information on her website about saving on repayment and refinancing. She goes into federal programs, laws on student loans, and provides advice on how to save the most on your repayment. Graduating college is a huge step. Upon graduating you feel really accomplished and excited for the new world. The only problem is your new world brings on financial responsibility especially for those student loans. Private student loans are a great way to pay for college. Usually upon graduating you will begin to make payments. Consolidating all of your loans can really make things easier on you depending how many you have, how many payments you pay per month, and if you are already in a stable job. The best deal is always one with less interest and whatever is easiest with your pay scale. Beware of companies who are just after your money. An individual needs to go into private consolidation with knowledge of what they are doing and why. Let’s start off with private refinancing to lessen multiple payments per month. Write out a list of all your payments per month and their interest rate. You need to know also how long this is set for. Once you know how many loans you have and their individual interest rates its time see if consolidating would be best for you. Keep in mind you are only looking at your private student loans, not federal. Currently there are seven different companies that provide this service. There are other companies but they don’t have as good of ratings on the web. These companies could all have different opportunities so it is important to check out each one and which may be best for your situation. The other common reason to want to consolidate also has to do with your interest rate. If a person has graduated and been out of school a couple years it is possible to have a good job and in some cases even an amazing job. If your credit has gotten better over the period of time from when you applied for your private student loan then it is possible you could significantly lower your interest rate with just knowing your credit score and contacting some of the available companies that I listed above. Many places offer free credit reports if you do not know your current credit score. The easiest site I have found to check your credit score is here. Just follow the steps and enter all your appropriate information. If your credit score is up fifty points or more it is possible you may be able to consolidate your private student loans for a cheaper monthly amount due to less interest. As you can see consolidating your private debt can be very easy if you qualify. Make sure you have all the correct information and have it all sorted it out before contacting any company. Once you are sure of your numbers and what you are looking for then it is pretty easy to see if the option would be better for you and your loan situation. Consolidating your student loans can lead to a better interest rate and lower payments. However, a bad deal can make you hurt in the long run. The determining factor in how easy getting a better rate will be is the type of interest you have. Consolidating federal debt is a fairly easy process that can be applied for online through the Department of Education. When you consolidate federal loans, the interest rate you pay ends up being the weighted middle of your previous interest rates rounded up to the nearest 1/8th of a percent. Therefore when you consolidated your federal loans you would end up with a rate 8.7%. That is still a pretty steep rate, but fortunately the consolidated rate for federal loans caps at 8.25%. No matter what your weighted middle actually is, the applied rate will never exceed 8.25%. Unfortunately, the same is not true for private debt. Federal rules now stipulate that filing for bankruptcy does not discharge student loan debt. This gives you very little leverage with private companies as they know you can’t get out of the loan no matter what. Consolidation is still possible, but the rate you will get depends on a much larger set of factors. Check around with different lenders as some get better rates than others. 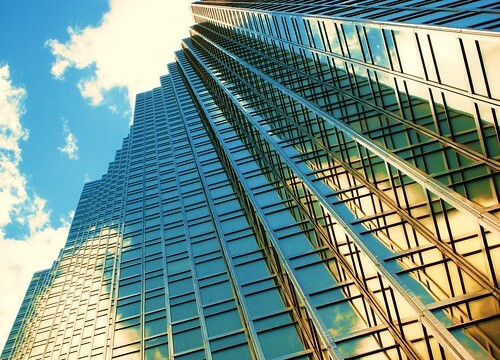 Often smaller banks have better rates than large corporations. Be careful not to take a plan that just lowers your monthly payments without lowering your interest rates unless you are in a financial bind. The smaller payment amount will only lead to more interest in the future and ends up costing you more. Your rate will most likely be determined by your credit score. Before you go shopping obtain a credit report. If your credit is low, try to make some timely payments in order to up your credit score before consolidating. Look into bonus discounts you can get while consolidating. Many private lenders offer small reductions in your interest rate if you allow them to automatically deduct it out of your checking account each month. Depending on the private lender, this can be between 0.25% and 0.5%. Though that may not seem like a lot, every bit helps when you are trying to get your debt down. Some private lenders also offer a 1% discount if you faithfully make payments for between two and two-and-a-half years. There is no easy way to deal with consolidation. Just remember to take your time when making choices, as they can affect your future for decades to come. Consolidating your loans is not something to rush. A lot of students who are gradating from college are then left holding a huge amount of debt. Regardless of whether you have a PLUS loan, a Stafford Loan, a Federal Perkins loan, or private student loan, there are a wide variety of consolidation services which are available to help consolidate all student loans into one single debt. By consolidating, this can result in a much lower interest rate, and in some cases this can also dramatically reduced monthly loan payments and help people pay off their debts much quicker. The good news is, many of the consolidation services will offer a fixed interest rates for the life of the loan, which allows you to lock that interest rate for as many years as it takes to pay off your student loans and you do not have to worry about the interest rates skyrocketing on you. What Should I Look For When Trying to Choose a Federal Student Loan Consolidation Company? One of the first things you should look for when choosing a consolidation company is their cost of service. There are various services available and the type of service you may need will depend on your particular debt situation. The cost of the debt consolidating service will greatly depend on whether your bills are current , slightly passed due or if they have been past due for months, or even years. It is important to check into more than one debt consolidating company and to be as open with them about your situation as you can. By exploring more options, you will ensure yourself you are working with a company with whom you feel comfortable with and feel you are getting a great day with at the same time. Another thing you should consider when choosing a consolidation company is the length of time it will take you to become debt free. The amount of time it takes will depend on your individual situation, so there is no set time frame which can be given up front. Once you have explained your financial situation to the debt consolidators, they will be able to give you an estimation of how long it will take to pay off the debt and for you to become debt free. You can receive as much as a 50% lower monthly payment obligation. There are never going to be any penalties for paying off early. If you choose a federal consolidation there is no fee. Your consolidation loan interest is also going to be deductible on your federal taxes. Student loans can be hard to pay back and can negatively affect the fun student life you are supposed to have when you head off to school. Once again, we are here to help! 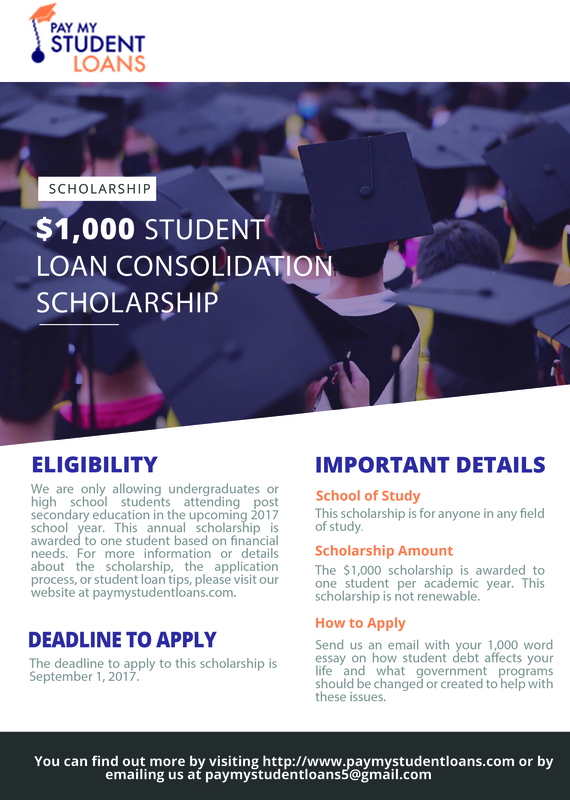 The $1000 Student Loan Consolidation Scholarship will provide financial aid to those students who are passionate about their education but struggle to pay their tuition without student loans. To have a chance of winning our scholarship, students must send us a 1000-word essay on how student debt affects your life and what government program should be changed or created. We are only allowing undergraduates or high school students attending post secondary education in the upcoming 2017 school year. This annual scholarship is awarded to one student based on financial needs. Create a piece of content that is 1000 words long and submit to us via a word.doc. Email us at paymystudentloans5@gmail.com and provide the attachment of your essay. Once you send us your submission, you give us permission to use it for marketing and promotions if we wish. The deadline is September 1st, 2017, and the winner will be selected within 2 weeks. If the prize is not claimed within a month of the selection date, another winner will be selected. We run our scholarship program yearly.